Our family celebrates something very special on our annual “It’s a Wonderful Life” night at our house. Everyone is home for the holidays. My husband schedules the date at least 6 months in advance on all of our calendars. We have a trivia quiz before dinner with appetizers, and after dinner we all watch the movie. However the entertainment does not stop there. My incredible hubby pulls together a special slideshow of yearly highlights AND gives a special speech: the “State of the Medearis Family” Address. The whole night is such a treat, and each year is different and moving in some way as we all reflect on our lives together. My part in this special evening? 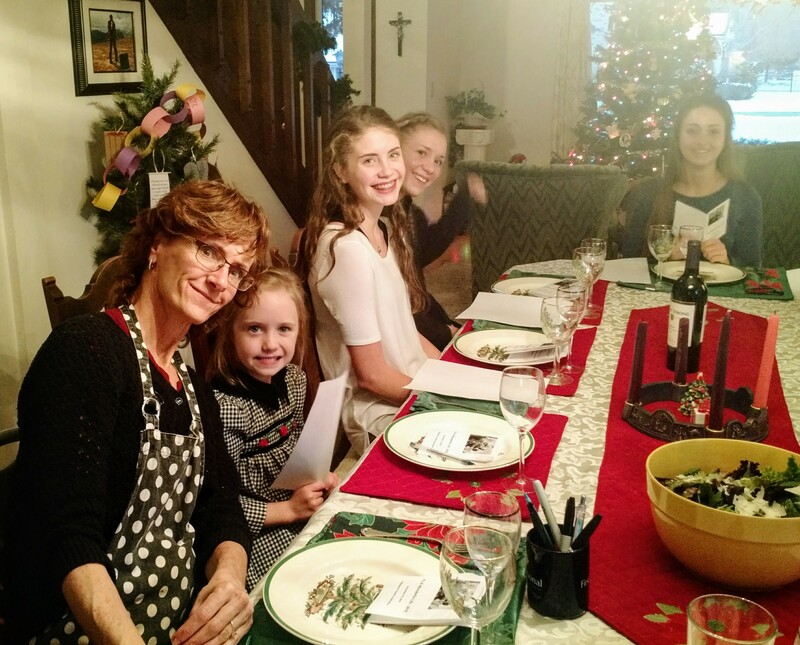 …A deliciously homemade holiday dinner by Mom. We had turkey again this year. My one daughter is preferential to poultry, and as she just returned from Tulsa, I indulged her. 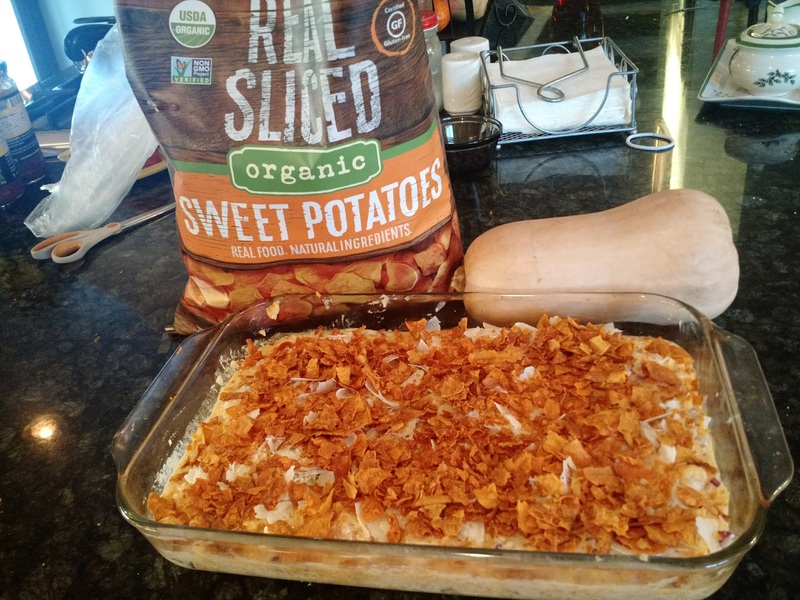 Besides the traditional mashed potatoes, green salad, cranberry sauce, and sugar cookies (paleo with cassava flour), we had one side dish that was new this year. Butternut squash casserole. I had to paleotize it (but not fully this time; I used dairy). Everyone really liked it. So this is the result. Enjoy! Bake squash: cut in half and remove seeds. Place in baking dish with water flesh side down. Bake at 350F for 30+ min or until tender when poked with fork. Scoop cooked squash flesh from its peel. Put aside. Preheat over to 400F. Grease a 9x13inch pan. Heat bacon grease/oil in a skillet over medium heat; cook and stir onions in the hot oil until softened, about 10 minutes, adding garlic in last 5 min. In large bowl, whisk eggs lightly. Then mix in pepper, salt, yogurt, milk and italian seasoning. Add mashed squash to this mixture. Then add onions and garlic from pan. Fill 9x13 in pan with mixture. Top with parm cheese (as much or as little as you want) and crushed chips. Bake in the preheated oven for about 20-30 minutes, or until thoroughly heated and lightly brown on top. This time I was using real dairy because I wanted to test recipe on family who could eat dairy (I used parm cheese and whole milk Greek yogurt). Next time I will try to use plain coconut or almond yogurt instead. And do Daiya cheese maybe so that more of us can indulge guilt-free.